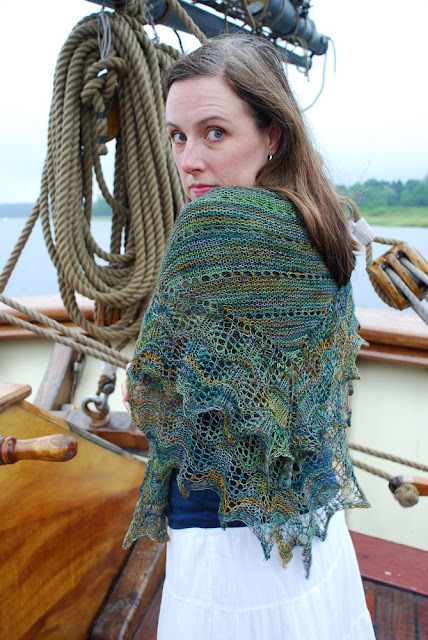 A new-world homage to the Shetland Hap shawls of old. 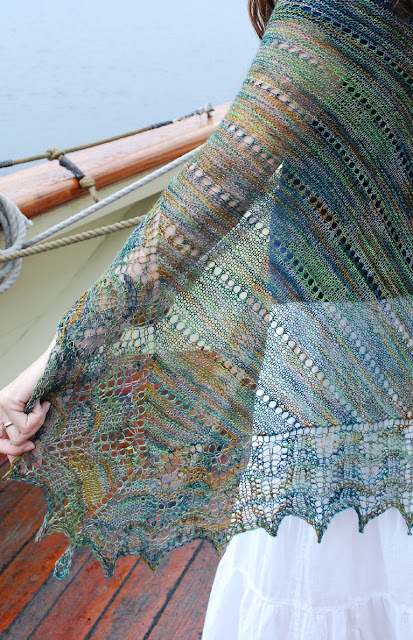 Worked all in one piece with one needle and one skein of yarn, this makes a perfect travel project, whether you’re waiting on a park bench, soaring above the clouds, or sailing the high seas. Plus, the Crest of the Wave pattern (provided in both written and charted forms), an interesting variant on the traditional Feather and Fan, is easy to master with spectacular results. What are you waiting for? It’s time to get Hap-py! Instructions are given for a swatch, which will make a perfect little shawl for an 18" doll, plus the full-size shawl, which measures 32" square. Swatch and shawl do use all of the skein of Madeline Tosh Prairie, so be aware that not achieving gauge may lead to your needing more yarn. I do love projects like this for travel: one "small of size but large of yardage" skein of yarn paired with a circular needle provides hours of knitting entertainment without the danger of losing a needle (or stabbing your seatmate). The central square (really a diamond kept on the square by working in Garter Stitch) is worked like Grandmother's Dishcloth plus the excitement of occasional eyelet rows. Then the edging is picked up all around the flexible sides of said diamond. 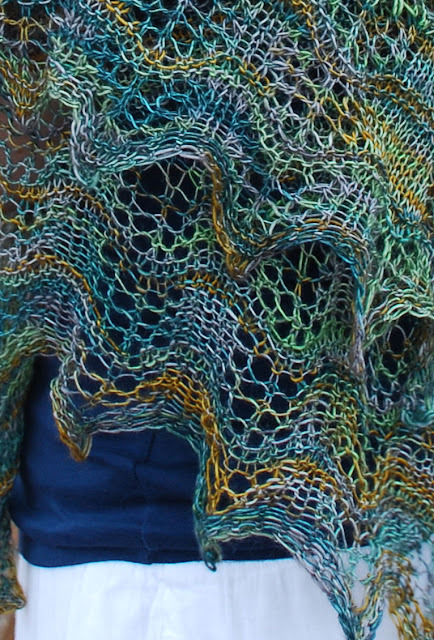 Working the center from point to point means your shawl is free from the tight edges that can result from casting on and binding off many stitches. I've included my recommended bindoff for producing the perfect, flexible edge for your shawl. Madeline Tosh Prairie [100% Superwash Merino; 840 yards/768 meters per 114 gram skein]; color: Plaid Blanket; 1 skein Note: With swatch, entire skein was used. 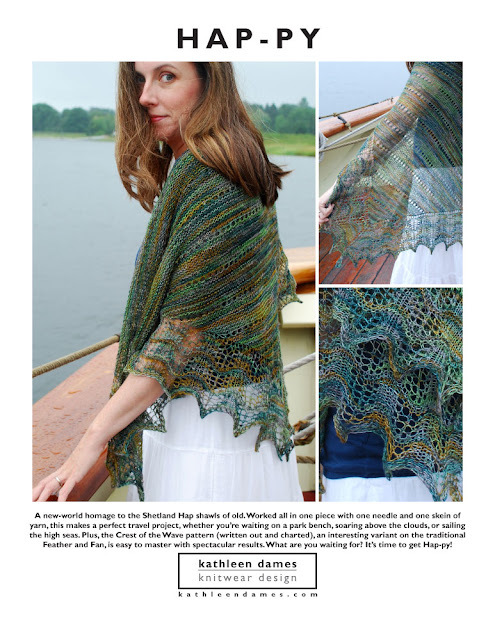 Everything you need to create your own beautiful Hap-py is provided in the professionally designed (by me!) pattern. Both written and charted versions of the Crest of the Wave stitch pattern are included. 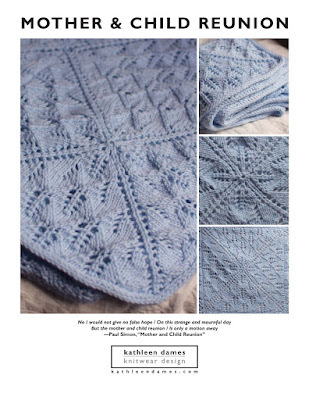 Lovely knitters who purchased this pattern when it was originally released should have received a message from Ravelry that the updated version of the pattern is now in your library. Don't miss the special customer coupon code!